Remember when you were a kid, and everyone made a New Year’s resolution? They had a life expectancy of about a week or two but during that time, you felt empowered. You had purpose. You were doing this thing! 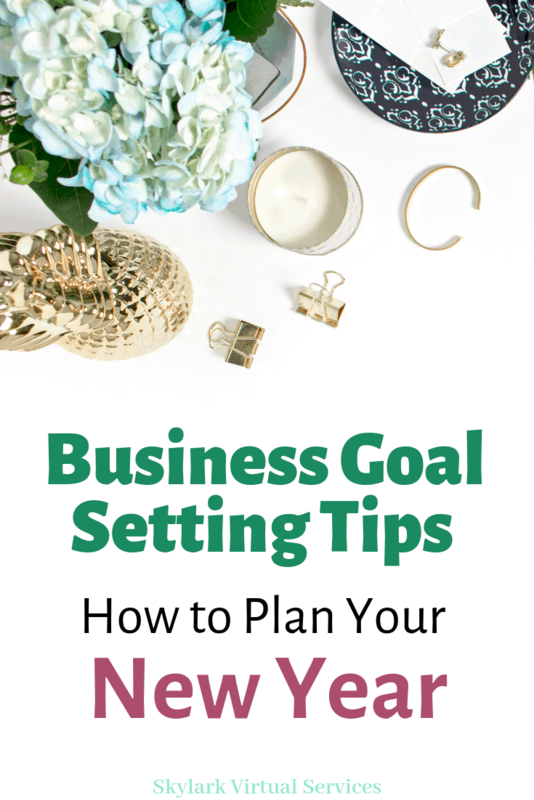 Business goal setting tips are aimed at bringing that feeling into your business but in a practical way that helps you plan for the coming year and feel like you know where you are going. How do you set business goals? Goal setting is something I haven’t done much prior to this year. Good intentions were visible in January with a little lack of actual substance behind them. I knew setting business goals was a good idea. But I was a little uncertain how what they actually should be. The one I ended up focusing on has been my monthly income and that has done pretty well. This year, I wanted to do things differently. I wanted to create goals with plans behind them. But the first question is how do you set business goals? Let’s plan the plan. What’s the big ‘why’ for your business and the big aim for it? 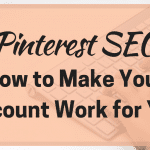 For me, I want to build a business that helps people grow their online presence in a wide range of ways – which means I will need help because I’m great at Pinterest and can write the content they need but not so much the other stuff. So my big dream is to have a team of experts who can help clients with all of their online digital marketing needs. What’s yours? Write it down – this year, five years, even ten years’ time. What will the business look like? What are you doing each day in it? What kind of work are you doing with what kind of clients? If you are a little uncertain what those dreams are, what you want to achieve, I would recommend trying Nadalie at It’s All About Boo’s new quiz. It is free and it helps you see what your goals should be – perfect if you are a little uncertain. I did it and got to focus on finances – which consider we want to get our first mortgage and move next year is pretty accurate! With all that future stuff firmly documented and out of your head, you can start looking at some of the ways you can get there. Brain dumps are a great idea for this, jotting down everything that might or might not be relevant to that big dream. Then make a list, focusing on one idea at a time and see what goals are needed to work towards that idea. Or you could use mind mapping to spot all the elements that need to come together to make this happen. Now you are ready to get into the really meaty parts of business goal setting. One of the most popular approaches is known as the SMART goal setting system. How do you create a SMART goal? So how does this help you set goals? To start with, your goal needs to be specific. No vague ‘I want to grow my business’ goals here. We want chunky, solid goals that are very specific. You want to grow your income from customers by 30% in the first quarter of the year. That’s specific. And it is measurable – you have given yourself a deadline for the first three months of the year to get that goal and you can track how you are doing. So after the first month, if you have seen an increase of 15% then you are doing well and can measure that you have a solid start. If you have seen a declined of 10% then you know you have a bit of a hill to climb. But is that 30% increase in income attainable? The third part of the goal setting is ‘attainable’, and this keeps you a little grounded. Sure you want to push, to make yourself work, to be challenged. However, a goal that has no way of becoming a reality isn’t going to do that – remember that little voice. Relevant is one that is important for businesses. Aiming to increase your Facebook page following by 250 people in three months might be relevant if you are teaching how to increase page following. 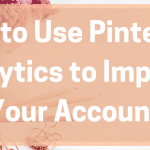 But if you are selling Pinterest management services, then this isn’t so relevant, especially when you consider how little traffic and potential enquiries the average Facebook page provides. Lastly, time-bound simple means you are putting a date on it. in this example, the first quarter or the first three months of the year. This is important as a deadline but also as a time to stop, assess and make changes for the next period. It can be whatever you need it to be, but most people find 90 day periods work well. Having just told you how to use SMART goals, I’m now going to tell you why they might not work for you. 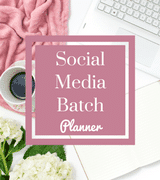 My friend Alyssa at Plan Like a Mom isn’t a fan of them for starters (she’s a productivity whizz) and while they are a popular way to goal set, I’ve always found them a little awkward. 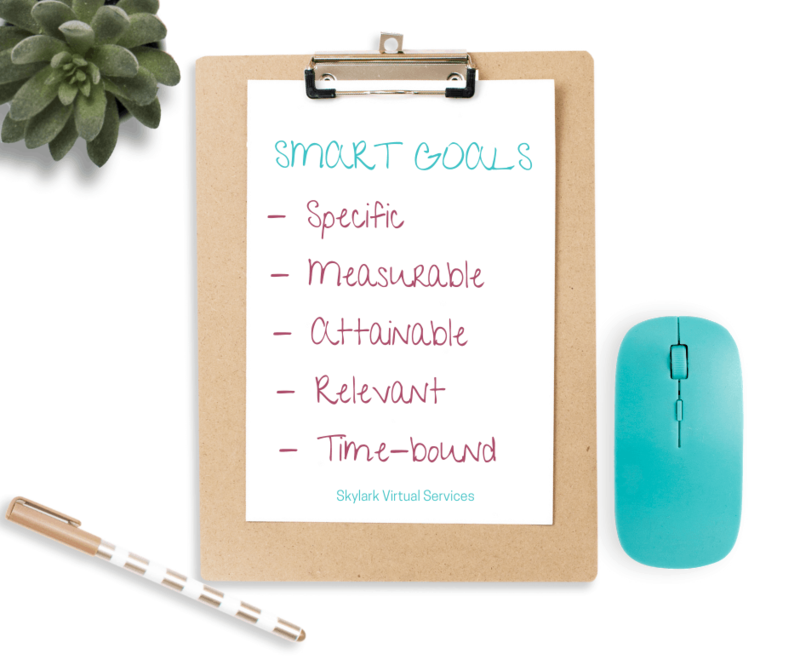 SMART goals are great for those very specific goal situations like we talked about above. 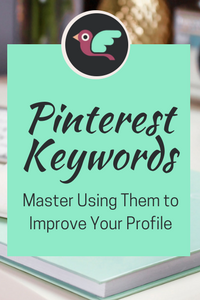 Growing customer income by a specific percentage, expanding customer numbers, working with a certain number of new customers. But what if your goals are a little more grandiose and a little more difficult to quantify? Not a SMART goal in sight! So while SMART goals can be very useful for practical goals, don’t limit yourself to this system and forget about the aspirational ones, the ones that defy being time-bound or relevant. That’s the theory out of the way, let’s get into some practical tips to help you find and set your goals, use them and achieve your aims. Writing something down is a powerful step, it makes it more real. Be firm with your language when you write them ‘will’ in place of ‘would like to’ and make sure there are no get-out clauses in what you say. You can also use one of my favourite tools, Trello, to keep a digital note of these goals. The goal is the first step, the plan on how to fulfil it is the next step. Create a list of the individual steps or components of the plan to get where you need to go. The more specific the better – and you can enjoy crossing them off as you go! 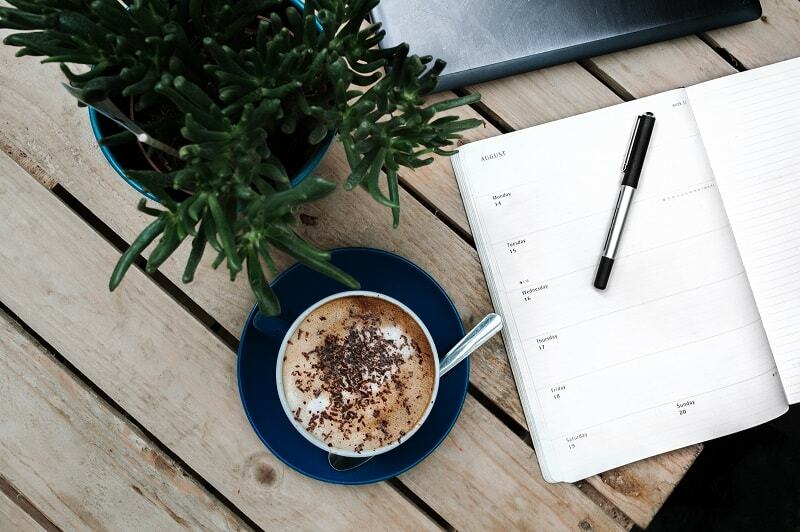 You can even create a to-do list or use a workspace in something like Asana to create the action plan and assign time or dates to each step. Sticking to goals can be tricky. You get de-motivated, things don’t work or there are other factors that interfere with your plans. There are lots of ways to help you stick with your goals so find one that works. I know lots of people use an accountability partner – someone who is also working towards goals who can help you stay on track and you can do the same for them. If you are like me, I have a list of jobs to do every day for my businesses. The priorities are always client work because people are paying me for these things. But then, the next priorities should be tasks relating to your goals. Put these above all other jobs, tasks and projects and do them as soon as possible. I was always a bit sceptical about the whole ‘visualise’ thing but I’m coming around a bit. And it can’t hurt to try. So remember those big dreams, the future plans and visualise what it will look like to fulfil them. And how these goals will help you do it. 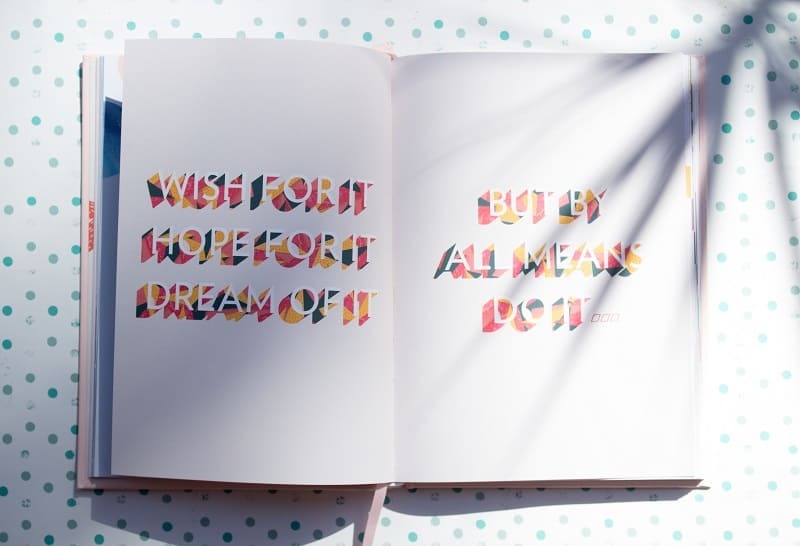 There’s no set route for successful business goal setting and that’s why these tips are quite varied. The important part is that you find a system that works for you. Use examples of goals along with business goals and objectives to create a clear roadmap of where you want to go. And don’t forget to reassess periodically to make sure they are working! Have you set any business goals for 2019? 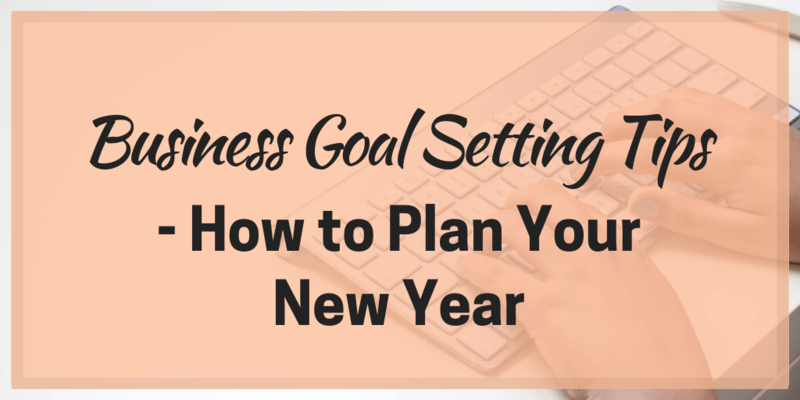 Or do you have some business goal setting tips to share? Pop them in the comments below! 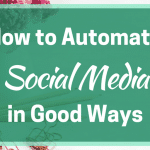 Keep losing track of your social media posts? Batching can solve the problem!